We are delighted to be abe to offer to you this brilliant Moto Guzzi Nuovo Falcone 500 in, genuine and in original condition. Great Bike!! Moto Guzzi's mighty fine 498cc, single cylinder, 4 stroke naked classic. 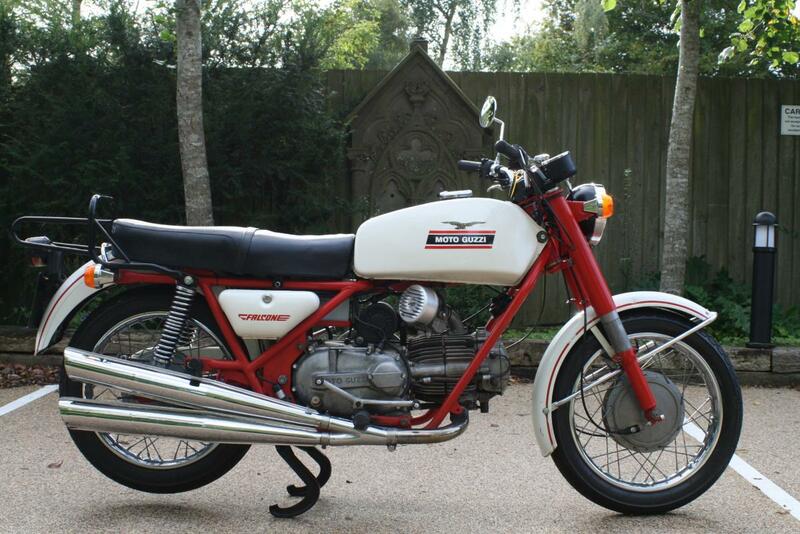 Several owners from new, this bike has just received a Moto Corsa engine overhaul and runs like a dream. Offered in original unmolested condition, a real peach. Described as "An escape from the frenzy, a complete antidote to stress and a lot cheaper than pills.'' On the Falcone it is immensely and surprisingly satisfying to proceed at a stately pace. Not that a Falcone is underpowered, just that it does things completely differently from modern bikes. Its most endearing feature is a massive external flywheel, hanging off an engine that develops a "massive" 26.2bhp but loads of torque. That's good enough for high 70's mph, but, much more important, it provides the ability to chuff along smoothly in top gear at between 40mph and 70mph, uphill and down dale. The Falcone is a joy in traffic, thanks to a low centre of gravity, crawler first gear and great reluctance to stall, even with the tick over set as low as 120rpm. It can be ridden with total confidence, feet up and lock-to-lock at about 2mph without touching the clutch. The Falcone's handling is classic Italian, combining accuracy, stability and excellent comfort. The twin-leading-shoe front brake works fine, too. A great appreciating asset and a joy to own.